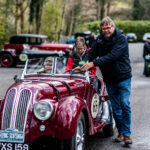 Flying Scotsman 2019 – Daily Videos – Ambleside – Slaley Hall 190 Miles. 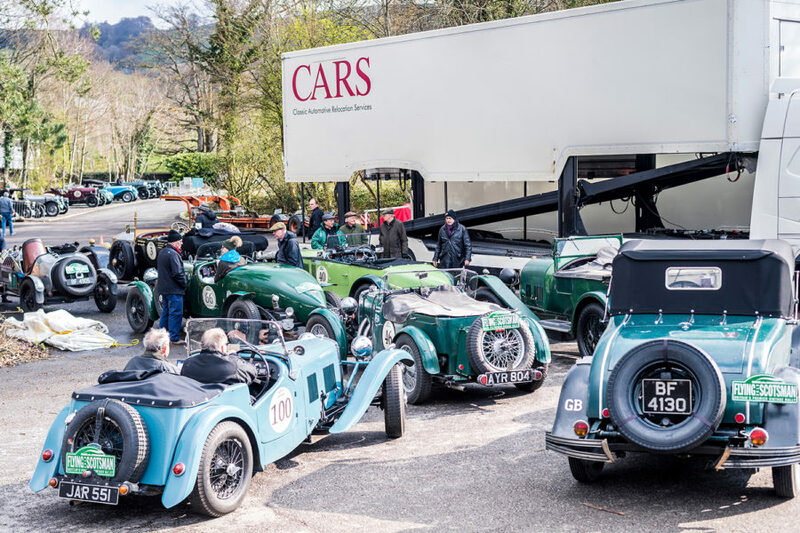 93 Pioneer, Vintage and Vintageant rally machines ranging from 1907 to 1948 assembled at the Low Wood Bay Resort on Lake Windemere, ready to start the 700 mile three day Flying Scotsman vintage rally echoing the spirit of a golden motoring era. 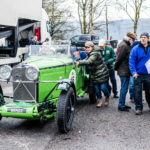 Staring number one are the daring British duo, David Ayre and Iain Wilson who will clamber aboard the monstrous seven litre 1907 Itala 40, perched high in their seats exposed to the elements. Right behind them an equally brave Dutch crew, slung a little bit lower but still exposed to the elements in their 1911 Knox R, Michel Laarman and Maryan Greif. Right through the valuable field of incredible vintage cars there are rare and precious cars. 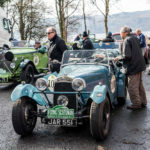 But the owners are determined to enjoy them throughout the course of many tests and regularities between the Lake District and the finish at Gleneagles in Scotland on Sunday. In the mean time, Jim who has come a long way to compete in the prestigious Flying Scotsman, is hoping a replacement navigator will be on their way. As Richard spoke a crescendo of shreeks and screams of joy temporarily blanked out the noise of the straight exhausts. Charles and Nellie Bishop hugged and congratulated Andrew Bailey and Philippa Spiller who just announced they had wed in secret! 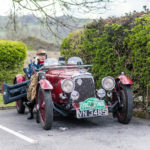 The new Mrs Bailey explained that they just got married quietly with only a small group attending, but they were not going to miss the ‘Flying Scotsman, “we’re here to enjoy the rally, it’s our Minimoon” said Andrew. 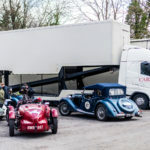 The glorious low slung 1933 Aston Martin Le Mans was putting in it’s final tests on the Lakeland roads, setting up the trip meter along the measured mile and sounding very throaty. 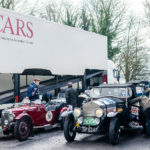 Driver Anthony Darwent and navigator Roger Osborne were equally preparing their kit for the ‘open elements’ 700 mile event, sporting full waterproof gear, black cork crash helmets and goggles. Regular rally man and former motor cycle racer Stephen Owens was unrecognisable in his full sheepskin head and body apparel. “ I’m hiding behind three sheep in here!” as he and navigator Nick Cooper snuggled in the cockpit of the sleek 1937 Jaguar SS100. “It’s us versus BMW!” added Stephen whose Jaguar is up against no fewer than seven Frazer Nash BMW 328’s also from 1937 in their class. Part of the Frazer Nash BMW opposition is provided by Peter Lovett, a formidable driver. His navigator is current Motorsport Chairman and boss of Prodrive Engineering, David Richards. 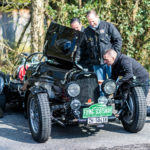 With crews from the USA, Germany, Norway, Holland, Belgium, France, Switzerland, Ireland, Sweden, Italy, Slovakia, and the UK taking part, the indication is that classic rallying is indeed in great health, especially the premier vintage rally,’ the Flying Scotsman’ dedicated to cars up to 1948 only. Spare a thought for the very nervous Polish first timers, Tomasz Dzitko and Beata Siwek in the ERA Arrive and Drive AC March 16/18 Speciale as they await the start on Saturday morning. With the first car way at 7.46am they start 67 minutes later, plenty of time to consider the expert competitors around them and the long road ahead.